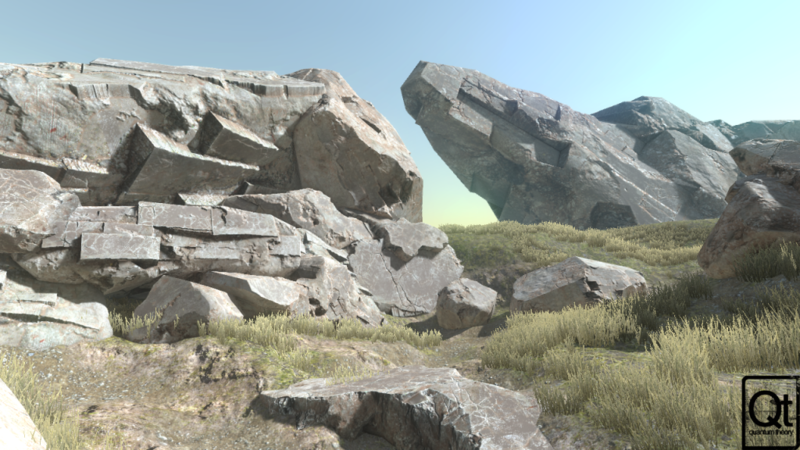 Better Rocks and Cliffs is 3d art pack of 6 high resolution rocks that can be rotated, scaled, and pushed together to create crisp, high quality environments. Each rock has its own 2048 albedo, normal, and roughness maps. For Unity, terrain textures are included as an added bonus. Many rocks I see in online content stores are either the old school “Iced Cream Scoop” mounds, or the unique geometry with a tiling diffuse and normal map. That type is probably the worst for detail considering the UVs cause it to appear as if the rock is melting. Badly mapped geometry takes the player out of the immersion of your game. These are all modeled in ZBrush and textured using masks from their high poly geometric data. Each rock’s side has a unique surface property, so you can rotate them and scale them to get alot of variety in a single scene. Some parts are hard-edged and flat, a result of setting smoothing groups by UV shells. Others are smooth shaded with bumped surface detail. The rocks range from 500 to 1000 triangles and are between 2 to 4 meters in size.